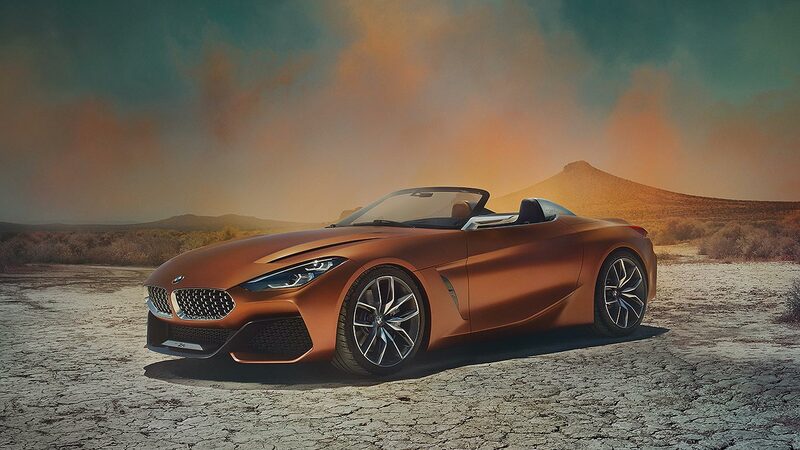 You are here: Home / News / Car News / BMW Concept Z4 revealed: meet the new 2018 Z4? 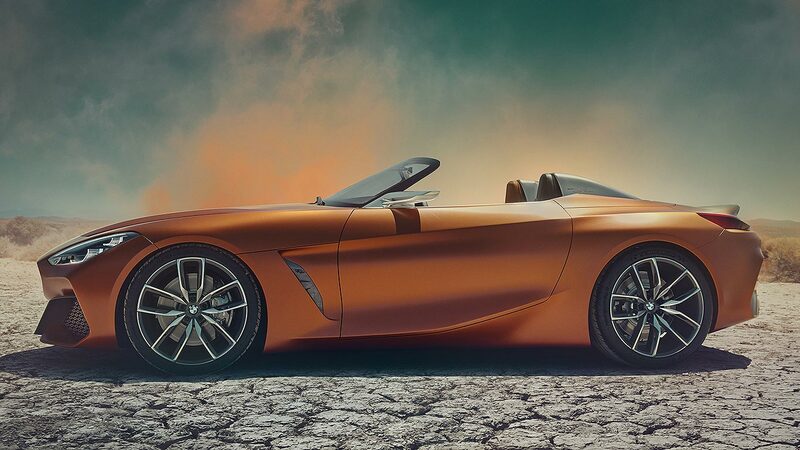 BMW has previewed the new 2018 Z4 at the Pebble Beach Concours d’Elegance, with this radical Concept Z4: officially called a design study, BMW’s happy to admit it gives us a first indication to how next year’s series production model will look. What is it? Why, “an all-out driving machine,” says BMW Group Design boss Adrian van Hooydonk, one that boats all the traditional roadster fundamentals: long wheelbase, low and stretched silhouette plus a stubby tail. 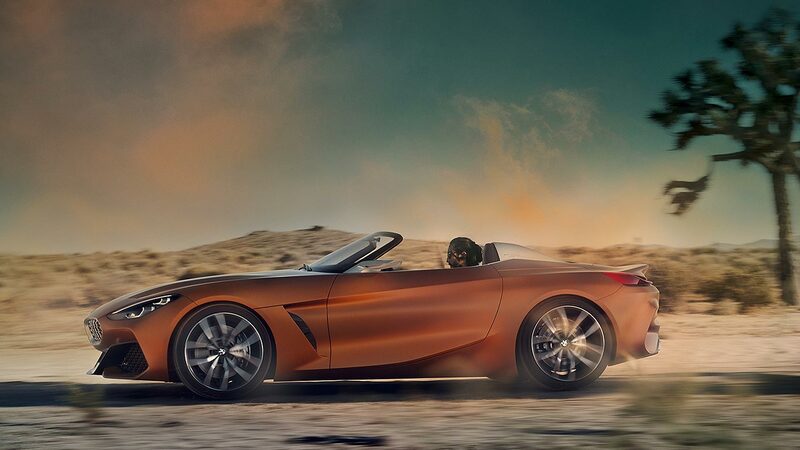 The bonnet isn’t as exaggeratedly long as previous BMW roadsters though, sitting the driver (and the engine) closer to the centre of the car, thus making it look sportier and, presumably, feel more agile to drive. This is BMW’s new design language at work, explains van Hooydonk: dynamic front end, clean-cut tail, striking body sides, minimalist lines and “subtle interplay between surfaces”. It’s been paired back a lot compared to, say, the busy-looking outgoing Z4, but it’s still all “enough to generate a sense of power and emotion,” he reckons. BMW says the front end references the Z8: headlights are mounted relatively high, with the double kidney grille set down low. The grille doesn’t have plain old vertical bars, but fancy mesh, as per the classic BMW 328 Mille Miglia. And, get this, the traditional BMW double-headlight layout has been reinterpreted, with the dual half-circle lamps stacked on top of one another rather than sitting side-by-side. 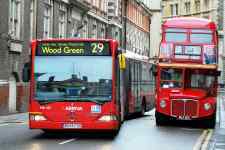 Is nothing sacred, traditionalists may right now be spluttering. We can’t see a front apron quite as extreme as this making it through to production but, again, you never know. 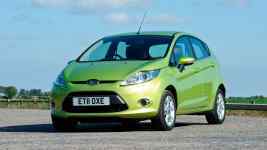 It feeds turbocharged petrol engines behind it – either a 2.0-litre four-cylinder or 3.0-litre inline six – and also provides cooling air that then filters back out through the side air breathers. The body sides are clean and voluminous. Fluid, beautifully rendered surfaces create a striking array of gentle light and shade as your eyes move across them: it’s organic, and set off perfectly by low-set and sharply-edged lower sills. BMW doesn’t run out of ideas at the rear, either: this is all pumped muscularity, bulging wheelarches and a lovely set of pure-form OLED tail lamps. 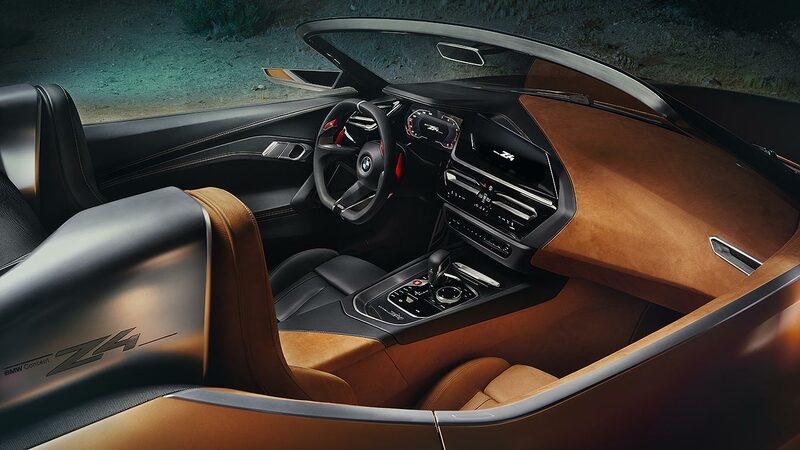 The interior blends familiar bits from new models such as the 5 Series, a parallelogram-shaped iDrive infotainment screen and an open-form electronic instrument binnacle with a simple leather-trimmed hood. Its chiselled design theme is distinctive, and that deeply-dished steering wheel is lovely: we’re desperate for that to make it through to production (although we’ll likely be denied: how might an airbag work effectively within it?). You might also have noticed that half the interior is black and the other half is a sort of browney orange. Yup, it’s on purpose: to create a “clearly defined area that warps around the driver like a capsule”, says BMW. Which then goes on to say something about it creating “a pure-of-purpose driving environment with a pronounced ‘cone of vision’, where the steering wheel as well as the surrounding black surfaces appear to be surging forward”. Quite. 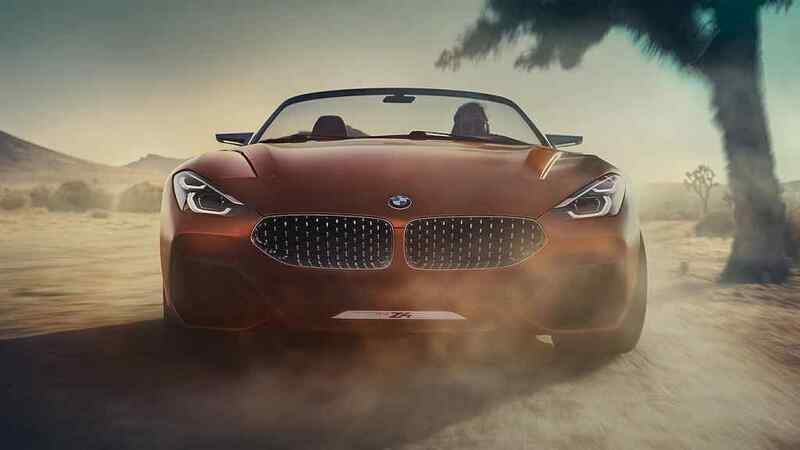 What next for the new BMW Z4? 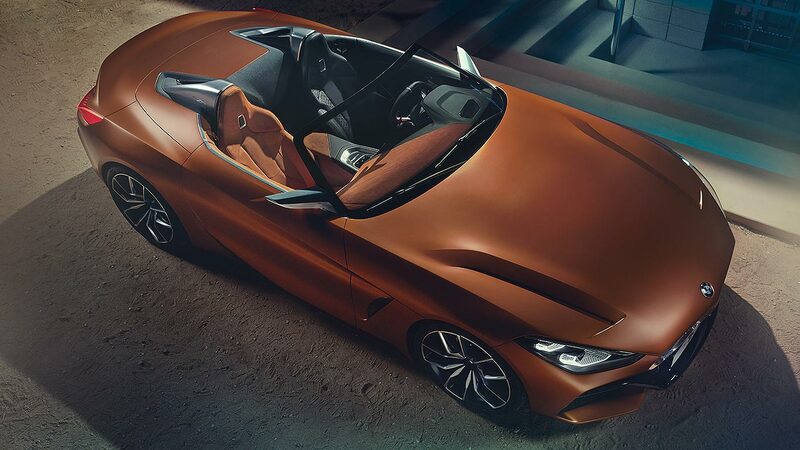 BMW is co-developing the new Z4 with Toyota; the latter will use the same scaleable architecture to revive the Supra. But unlike that other Toyota sports car joint venture, the GT86-Subaru BRZ project, there’ll be more differentiation here. 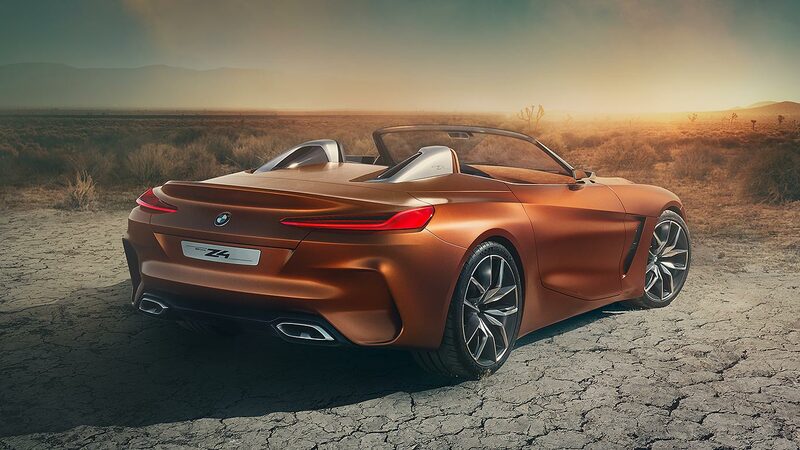 Not least, the fact BMW’s Z4 sticks with an open-top while the Supra will be a hard-top coupe. Both will be rear-wheel drive, and the Supra will use a Toyota V6, while the BMW will boast all-Munich engines. There could even be a range-topper producing up to 450hp: yes, that’s exactly what the 3.0-litre straight-six produces in the M3 Competition Pack. We can certainly expect to see the Z4 next year, with production likely to be well underway by the autumn. As for the Supra, time will tell. Most of the spy shots up to now have been of the Bimmer, suggesting it may be the one that’s delivered first. Surely the very fact we’re getting a new Supra at all means the wait will be worth it? 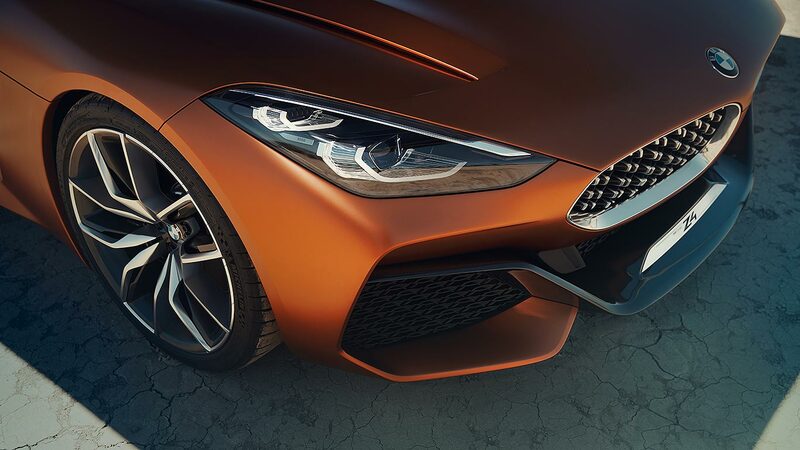 https://www.motoringresearch.com/wp-content/uploads/2017/08/BMW_Concept_Z4_11.jpg 768 1366 Richard Aucock https://www.motoringresearch.com/wp-content/uploads/2018/12/mr-top-motoring.svg Richard Aucock2017-08-17 18:00:482017-08-17 18:44:43BMW Concept Z4 revealed: meet the new 2018 Z4?